Dr. Siddiqui is Principal Program Manager, Health Solutions Group, Microsoft Corp. and Chair, American College of Radiology’s IT and Informatics Committee. In Dr. Siegel’s introduction, he talked about how radiologists are inundated by the number of images they have to read. Today, the average study contains 1000 to 2000 images. Radiologists are reading about 50 studies a day, and can see on the order of 50,000 images per day. Couple this with a nationally recognized radiologist shortage, and it becomes important to focus on optimizing the reading room environment in order to improve workflow and prevent loss of radiologists due to work-related injuries. In this talk, I explain the way we re-designed our radiology reading room at the Baltimore Veterans’ Administration (VA) Medical Center and I provide practical tips for how radiologists can optimize their current reading rooms without performing architectural re-designs and without purchasing new chairs or desks. There are numerous studies that show how an optimized work environment leads to increased productivity. So how do our reading rooms look today and are these environments optimized? Figure 1 shows two reading rooms that are sadly all too typical. Note the clutter, the inappropriate use of the reading room as a storage area and the mess of tangled wiring. In some cases it can be a challenge just to figure out which keyboard and mouse combination you must use for a given application. Poor conditions in a reading room can cause visual strain, musculoskeletal disorders, and in general, they can lead to an unhappy staff—and that can have a negative impact on patient care. So how do you tailor this space to suit the interpretation of radiological images? Perception plays into the overall room design, but consider the effects of lighting, ergonomics, seating, sound and workflow. All of these affect the tasks associated with reading images. Radiologists are closely linked to the environment in which they read. Just imagine the amount of information a pilot has to go through when flying a plane. Everything in the cockpit is ergonomically laid out so that pilots can receive all the information they need in an appropriate manner. Comparatively speaking, a pilot’s functions are confined to one area and one seat. In radiology, workflow becomes a major factor because the reading room is an environment where highly variable tasks are performed. A radiologist may work for hours in isolation, or collaborate with one or more colleagues or a whole group of colleagues as part of clinical rounds. So the space changes its role based on how it is used. 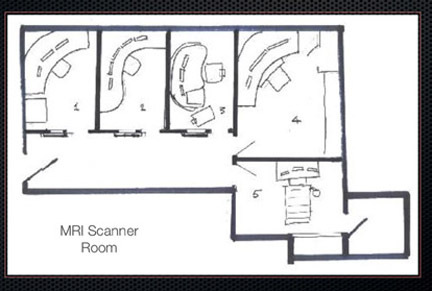 Our old radiology reading room was a large open space (Figure 2). There was a problem with ambient noise and the room was inefficiently designed. 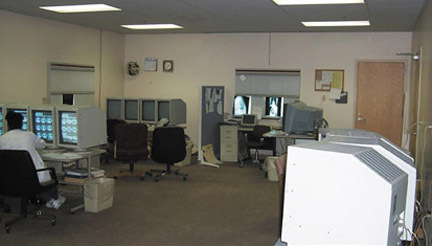 We had no ability to customize the workspace to any one radiologist’s preference. The reading room environment plays a significant role in diagnostic accuracy. We have done several studies at the Baltimore VA to measure the impact of the environment on clinical practice. In one measure, we examined fatigue levels as a function of ambient room light. We had 3 light settings, off, half on (or balanced lighting) and full on. We asked radiologists to report on the fatigue level in each setting. The fatigue was high if the lights were fully on. Fatigue levels were low to medium if the lights were half on or off. Next, we looked at diagnostic accuracy as affected by the ambient light and we found that having the lights fully on or fully off led to an average 14% decreased accuracy compared with a balanced light setting. So we evaluated our reading room and looked for ways to optimize the space, while creating a low-stress and high-productivity environment. We also wanted this room to showcase the benefits of ergonomic room design concepts and we wanted to use it as a research environment to better understand the physical, cognitive and ergonomic factors that impact radiologists. We went through a Charette Process approach, which is a concentrated effort to solve an architectural problem. We tapped experts in different domains to arrive at the best possible reading room (Figure 3). Our team included radiology experts, lighting experts and industrial design experts. In its final form, our reading room ended up being a hybrid of a cubicle environment that was partitioned into 5 different spaces. To control lighting conditions we employed indirect ambient room lights and individual workspace lights that the radiologist can control. The lighting is computer-controlled and fully programmable and the dimmable controls allow maximum flexibility for each individual radiologist. Each radiologist can adjust lighting based on the type of studies being read: if reading a study with high brightness, the radiologist can increase the lighting to create a balance; if reading darker studies, the radiologist can decrease the lighting. Each workspace also features user-adjustable temperature controls and heated floor mats. Because the new reading room is adjacent to a lobby, as well as a magnetic resonance imaging (MRI) scanner, we added acoustic devices to generate a low level of “white noise,” which is focused in the audible range of speech and MRI scanner noise. This balances out the hum from the MRI and the sound from the lobby. Each of the cubicle areas was built with sound-absorbing materials and acoustic paneling. We tested a wide range of furniture and table designs to maximize the radiologist’s productivity and reduce back strain and carpal-and cubital-tunnel strains. Seats should have back rests and adjustable back, elbow and shoulder support. We also experimented with an exercise-while-you-work concept where a radiologist could read studies while on a treadmill. Instead of going to a gym after work, radiologists are able to spend 2 to 3 hours walking while they are working. The treadmill workstation has become a fairly popular area of our reading room. We have done studies of the effect of walking on diagnostic capabilities and found that there is no effect on interpretation time or on the ability to detect lung nodules while standing, walking or sitting. While it is an aesthetic improvement to some degree, we find that allowing radiologists to personalize their workspace can increase productivity. Although radiologist workstations are shared resources, we like to personalize the space with digital photographs in the display, and unique lighting and furniture settings that are customized for the user. Each workstation PC also features a dashboard that is optimized for that user’s preferences, with features like a stock market ticker, child care Web cam, etc. So if there is no money in the budget for an architectural re-design or for new furniture, I present 10 steps that can be taken today to increase productivity. Step 1: Go paperless. If you use post-it notes, consider using digital post-it notes to create less clutter. Step 2: Use reading lamps to supplement ambient lighting so radiologists don’t disturb others by turning up the room lights. Step 3: Change the color and text of your windows and decrease the white background on applications to a grayish background. This will help the radiologist adjust or adapt to changes in bright and dark areas and help with contrast differentiation. Step 4: Adjust pointer speed and consider the use of a mouse odometer. This could help reduce repeated mouse movements to get from monitor 1 to monitor 5 in a multiple-monitor reading environment. You can also use a mouse odometer to track, and potentially decrease, mouse movements. Step 5: Use the 20/20/20 Rule to decrease eye fatigue: Every 20 minutes look 20 feet away for 20 seconds. Step 6: Employ the 20/20 Defense and get your eyes checked. We have noticed that 20% of radiologists in our division did not have 20/20 vision. Step 7: Do not stare at your words when doing voice recognition (VR); stare at the images. It is better to let your dictation run and edit it later, than to jump from a white background on the VR screen to the dark background of your images. Step 8: Train your VR systems to account for the background noise in your reading room. When you set up your VR system, make sure you use appropriate pauses so the software learns to account for the background nose. If you appropriately pause at the pauses that are indicated in the learning text, you will improve the accuracy of the software. Step 9: Obtain programmable input devices so you can automate common tasks within PACS and reduce the number of clicks required to access certain features. Using shortcuts could reduce a three- or four-click procedure to one click or keystroke. Step 10: Use ergonomically designed input devices, e.g. keyboards and mice that can appropriately reduce carpal tunnel or wrist injury. ELIOT L. SIEGEL, MD: One thing you didn’t talk about very much was the question of monitors. You talked about the fact that monitor brightness should match ambient room light. Radiologists have moved out of the darkness now that the luminance has gotten higher, but should I buy a monochrome monitor or should I buy a color monitor? Should I get a 5 mexapixel (MP) monitor, should I get a medical grade monitor, or can I go to my local PC store and buy something off the shelf that is non–medical-grade and save some money? Should there be a difference between what radiologists are reading on vs. what our ICU or ER physicians are reading on? DR. SIDDIQUI: Excluding mammography, monitor resolution does not have that much of an effect on diagnostic accuracy. If you look at interstitial lung disease, fractures, lung nodules and bone pathologies, there is no difference in diagnostic accuracy amongst different monitor types. DR. SIEGEL: So after I get my eyes checked and ensure my vision is 20/20 can I go to any computer store and buy a monitor? DR. SIDDIQUI: well the key difference would be monitor luminance. Numerous studies have shown that luminance actually does make a difference, especially if you have a higher or lower luminance that is not properly matched to the ambient room lighting. The uniformity of luminance amongst multiple monitors is also important. Off-the-shelf monitors that do not support the DICOM grayscale display functionality will not have the same uniformity as medical-grade monitors. DR. SIEGEL: What is the DICOM grayscale display functionality? DR. SIDDIQUI: DICOM grayscale display functionality is a DICOM standard that ensures that pathology will be seen at a certain gray level from one monitor to another. So if you see a lung nodule with a certain density, it appears as the same level of density across all monitors. It also uses a perceptual visual model so that a certain change in luminosity, as perceived by our visual system, is corrected. So it corrects for the fact that we have a nonlinear visual system. We have not seen a difference in diagnostic accuracy between monitors that support DICOM gray scale display functionality vs. those that do not support it. Some physicists have shown a difference but we have not measured or observed this clinically. 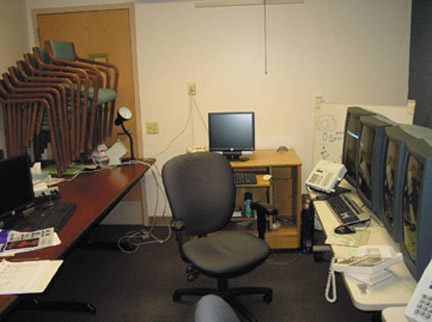 At the University of Maryland/Baltimore VA, we used color monitors for ultrasound and other modalities with color, and we used off-the-shelf monitors for this in the ER, chest and musculoskeletal reading rooms. We haven’t seen any difference in accuracy or received any complaints from radiologists. The medical-grade monitors tend to be smaller and people generally prefer larger screens. But the medical-grade monitors have faster calibration schemes. If you use non–medical-grade monitors you have to have your own methods of ensuring that they are consistent and there are numerous tools out there. If the monitor falls out of conformity it is relatively easy to replace a $300 to $400 monitor. DR. SIEGEL: Rasu, have you looked to re-design the reading rooms at the University of Pittsburgh Medical Center? RASU B. SHRESTHA, MD, MBA: At UPMC we are in the midst of re-designing our reading rooms. In addition to what was mentioned today we have played with the color of the room. We found that if the room is painted a darker shade it seems to have more of an acceptance in terms of the ambient light conditions in the room. As you divide the room into various sections, we use soft padding and the boards we use as dividers are made of noise-canceling material. 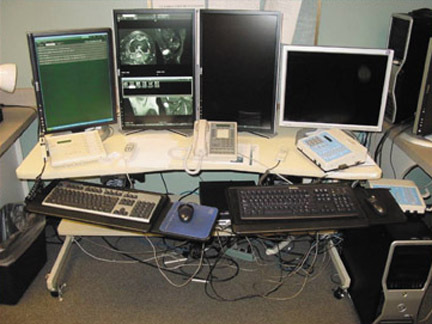 We are also moving everything to a centralized radiology workspace so we can limit the number of times a radiologist has to use different workstations. The concept of a unified radiology workspace is more real today than it was yesterday. DANIEL L. RUBIN, MD, MS: In our institution, we get interruption form telephone calls and clinicians coming into the reading room. It is highly disruptive to our workflow and concentration. Have you studied that effect on diagnostic accuracy and do you have recommendations on having maybe a second group to handle these calls and consults to let the radiologist work uninterrupted? DR. SIDDIQUI: Interruption is a big factor. We found that after an interruption there is latency before the radiologist returns to the previous level of productivity. The latency is based on the timeframe of the interruption. We have been triaging the interruptions by having the administrator or another radiologist talk to the clinicians and intercept these requests. However, we did not solve this in CT because we only had one radiologist reading CT and that person had to do a lot of consultation. DR. SIEGEL: Consults are not the only disruption. Many times it is necessary to communicate findings, for instance, we are also making calls when there is an unexpected asymmetry in the region of the right lung apex. These typically turn out to be benign but we are now communicating these results directly with our colleagues in addition to our reports. We want things that on face value are completely contradictory. We want to interact with our clinician colleagues but we don’t want to be interrupted. Khan had two workstations and he would sometimes read in his office and sometime he would read in the reading room to interact with colleagues. We thought we could address the issue of disruptive consultation by putting the clinicians up in a little audio/visual window in the radiologist’s workstation. The radiology group vehemently voted that down because of the potential for constant interruptions. There are interesting technical, social and political challenges to fix this. How do you work things at Stanford? Where do radiologists read? DR. RUBIN: They read in the reading room and this is a challenge. It impacts workflow. I don’t know if there are any studies of how accuracy is affected after an interruption, but just looking at studies of cell-phone usage by motorists, you can see a clear correlation between distracted drivers and high accident rates. Some of our radiologists go to a completely separate area when they want to read, particularly on weekends. Perhaps we need to structure our service so radiologists who are not reading can interact with clinicians. Or perhaps we need formal office hours. Reading room renovation: Practical and cost-effective tips. Appl Radiol.